MPECS Inc. Blog: New Acer XP SP2 + Office 2007 SBE = 1GB Microsoft Updates! New Acer XP SP2 + Office 2007 SBE = 1GB Microsoft Updates! This has to be a record for us! Included in the updates is Office 2007 SP1, Office 2003 SP3, SQL 2005 Express SP2, and a couple of other larger ones. This is a new Acer TravelMate 7720 that has been downgraded to XP Pro SP2 with Office 2007 Small Business Edition installed. The actual download volume may be a lot less depending on how the Office 2007 SP1 download comes down. In the list it is indicated at 697MB! We have mentioned about our Workbench Bandwidth Saver before, however what we have discovered is that it is only working with XP loads. Windows Vista seems to have its own way about getting the updates and that way seems to bypass the caching feature of ISA 2000. So, what that means is we are not plugging in any Vista machines that will be delivered to client sites where they have WSUS installed. The other option for us is to use the suggestion that Chris mentioned in the comments of the above earlier post: Import the registry settings for our WSUS server and wuauclt /resetauthorization /detectnow until the system has gone through all of the necessary install and reboot cycles. We place the above wuauclt command into a batch file that is on our Technician's Thumb Drive and copied to the desktop on any system we are installing. 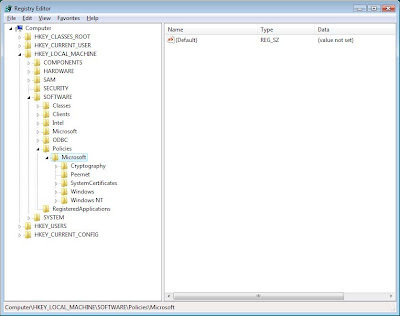 A copy of the batch file also resides on the client's WSS Companyweb site along with a share \\MySBS\Company\Network Admin\ folder that we keep somewhere on the network. Note that MYSBS-SBS01 would be your own internal or workbench server. You could always export the settings from one of the Vista workstations on the domain hosting WSUS v3 that is to be used as an update source. If the domain is workbench based, or a new setup for the workbench, and no Vista machines have touched it yet then a vanilla Vista VM would work to at least connect to the WSUS v3 server and get all Vista related updates cached. Once all of the install cycles have completed, delete the above imported registry settings, force a GP refresh, reboot, and the system should connect to Microsoft's update site with no problems. For those systems that are going to be installed in a peer to peer or stand-alone situation, make sure to run "Windows Update" from the Search field and upgrade the system's update source to Microsoft Update to catch updates for Microsoft Office and the like. Thanks Chris for the initial pointer. It looks like we will be using this method to update Vista as we go forward. We just need to figure out if we are going to install a separate WSUS v3 instance on the workbench LAN.